100 MILE HOUSE, BC: A second case of measles infection has been confirmed in the Interior Health region, in 100 Mile House. case of measles in 100 Mile House, confirmed on March 9, 2019. Both cases are connected to outbreaks outside of the province and are not linked to cases on the B.C. coast. These are the only confirmed cases of measles in Interior Health at this time. Interior Health is monitoring and following up with individuals who may have been in contact with the patient to determine immunization status and, if necessary, offering the post-exposure protection. The risk to the broader public is considered low. If you were at the following location during this time, you may have been exposed to measles. Wednesday, March 13, 2019 – Interlakes Market, 100 Mile House, 6:30 p.m. to 9:30 p.m.
your vaccine history, determine your immunity to measles, and arrange for vaccinations if needed. 9 a.m. to noon and 1 p.m. to 4 p.m.
Tuesday, March 26- 9 a.m. to noon and 1- 4 p.m.
Wednesday, March 27- 1 p.m. to 4 p.m.
Thursday, March 28- 1 p.m. to 4 p.m.
Friday, March 29- 9 a.m. to noon and 1- 4 p.m. 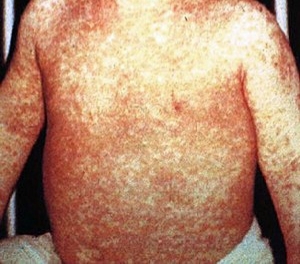 Anyone who is concerned about exposure to measles should watch for symptoms of measles. Symptoms include fever, cough, runny nose, and red and inflamed eyes. Please call ahead to your doctor’s office or the hospital if you think you may have been exposed to measles and have developed symptoms. This will allow the office or hospital to make a plan to prevent other people from potential exposure. Written and released by Interior Health.